Golf is a game of perseverance and a lot of hands-on skills. A golfer needs to give a lot of time on practicing to excel at it. Every golfer face the body stress due to the nature of the swing and undergoes various golf injuries. It is a very obvious thing for the golfers to suffer from different kind of nagging injuries several times or at least once. Even those who play golf casually also experience some common golf injuries. If you want to play golf, you have to know about the golf injuries and golf injury preventions. When there is eruption and pain on the inside of the upper arm close to the elbow is called golfer’s elbow. When someone feels pain or soreness on the outside of the upper arm close to the elbow is called Tennis elbow. Most of the golfers suffer from tennis elbow. You may feel pain while doing a backswing or at impact. Treatment may vary from person to person depending on the severity of the problem. The possible treatments are like medications, rest, surgery, cortisone, counter force bracing and therapy. + Before impact, do not decelerate the club. + Do not expand the hands prematurely at the top of the back swing for a few days. It is a very common injuries that the golfers come across no matter how professional he is. Both amateurs and expert golfers suffer from back pain. Year-long practice of swing causes back pain to the golfers. Sometimes you need to give pressure on swing even after mastering it. Back pain occurs due to some other factors such as arthritis, muscle pain, disk related problems, stress fracture, mechanical problems etc. ​The golfers should train themselves on the perfect swing. They should also know proper back mechanics as well as practice proper stretching. You must avoid placing your feet too far apart while you have back pain. It is a stress disorder that occurs in the nerves of the hand repetitively. The symptoms of this disorder is wrist area pain, tingling and numbness of the fingers, clumsiness and weakness of the hand. The possible treatments can be splinting, medication, rest. One may need a surgery if it is a worst case. Golfers should not give high pressure on the club grip as high pressure makes the swing less accurate and increases the wrist problems. The reason behind the behind the shoulder pain is acromioclavicular joint arthritis, rotator cuff tendonitis, impingement, scapular lag, instability etc. Symptoms of this problem are upper arm pain at the different phases of golf swing and night pain. The treatments of this problem is therapy, medication, rest, cortisone injection and at times surgery depending on the level of pain or severity. 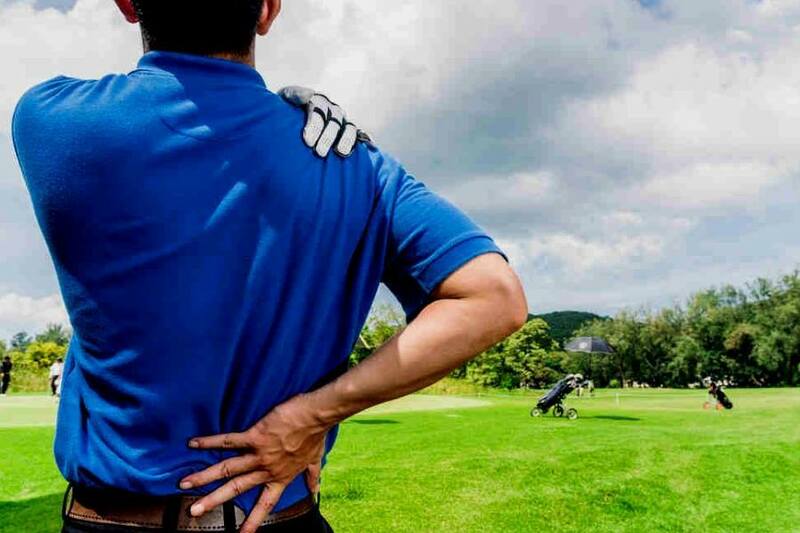 ​You have to stretch your shoulder joints before playing golf. You can make your scapular muscle flexible by exercising to prevent the injury. Do not practice back swing with very high speed while having shoulder pain. Otherwise it will increase the stress on the shoulders. One of the common golf injuries is knee pain. It occurs due to a number of reasons. Knee injuries may originate from the force placed on the knee to stabilize the spinning of the axis of the hip at the starting of the swing. Some other causes of this pain are osteoarthritis, torn meniscus and chondromalacia. The symptoms of knee pain are swelling or clicking of the knee making it worse by squatting or twisting. The possible treatments are medication, rest, arthroscopic surgery, injection treatment, therapy, bracing and total joint replacement. You should see a doctor if you feel pain on the knee because the treatment mostly depends on the severity of the swelling. New golfers are prone to have neck injury. They are not habituated to twisting the body for so long. The neck muscles get shorten in spasm as a result of hour-long hitting the balls and swinging the club and hence you might feel the pain of having a stiff neck. You need to exercise to strengthen and make your neck and upper back flexible. You may take breaks during playing golf to avoid neck injury. You can work up slowly to longer periods for practicing golf. If you choose wrong footwear while playing golf then you might suffer from plantar fasciitis. It is a swelling of the plantar fascia which is located under the foot sole. It is attached to the heel bone. The symptom of this problem is feeling pain in the heel early in the morning. It is a common injury for the golfers. It occurs due to the swing at high speed and the repetitive golf motions. These two factors increases the risk of having injuries in the hand and fingers. Repetitive blunt trauma of the fingers are the reason behind many worst conditions like deformed or broken bones, tendinitis, hypothenar hammer syndrome. You can take some measures to prevent these injuries such as knowing the proper grip, not hitting balls on the artificial mat, not trying long period of ball bashing. Golfers undergo DeQuervain’s tendinitis mostly. Pain, swelling and tenderness at the wrists close to the base of the thumb are the typical symptoms of tendinitis. Generally people feel pain at the left wrist while doing a backswing. It occurs by the swelling in the tendons controlling the thumb. Tendinitis also happens due to premature release of hands and excessive tilting of the wrist. Its symptoms have similarities with the thumb arthritis. The possible treatments are splinting of thumb spica, medication, rest, cortisone, therapy, surgery etc. Sometimes doctors suggest an x-ray to check the severity of the problem. Avoid releasing the hand prematurely at the backswing. Hip is more vulnerable to get injured while playing golf than any other part of the body though hip is a mobile organ and it endures a lot of stress and weight. Golfers need to do pivoting and twisting movement for practicing golf swing. They also have to adduct repeatedly during a swing. It impose a tremendous amount of force on the hip. Low back injuries and groin strains occur due to shear and rotational forces. Since the hip joint is similar to the rotator cuff, hip injuries are similar to the tear of the rotator cuff too. You need to make the hip muscle flexible as well as add strength to it in order to prevent injuries. So before playing golf always try to do some routine exercise to warm up the muscles.